When it comes to beauty brands, it’s safe to say we’ve tried almost everything — there are good ones all around us. But truly great ones with laudable makeup and skincare? Not so much. In comes Chantecaille (pronounced shan-tuh-kai), a luxury French beauty brand that’s based in New York. Chantecaille is a powerful legacy brand; founder Sylvie Chantecaille co-started Prescriptives with Estee Lauder in 1979, and helped doyenne of dresses Diane Von Furstenberg launch cosmetics in the 1970s. Today, Sylvie runs it with her family, notably with her daughters Olivia and Alexandra. Known among the society crowd and the world’s who’s who (we hear Angelina Jolie is a fan), Chantecaille has remained distinctly under-the-radar. While we love keeping a good beauty secret, it’s time we share this with the world too. Here’s why it should be on your radar. Chantecaille makes botanical skincare lush. The products are infused with powerful plant stem cells and formulated using ground-breaking technology. This, together with an emphasis on the right textures, scents and colours, spells truly luxurious products.The new Blanc Gardenia line, for instance, combines potent botanicals and exclusive gardenia stem cell extracts to reduce dark spots and naturally brighten skin. Founders Alex and Philippe Chantecaille travelled to the North Pole in June 2018 in hopes of understanding the full gravity of the shrinking ice caps. To do their part for environmental conservation, Chantecaille is now committed to planting trees. A single tree can produce enough oxygen in a year to keep a family of four breathing, increase bird biodiversity and even filter 36,500 gallons of water per year. This commitment to the earth is echoed in its products; they are cruelty free and do not use phthalates, sulphates, detergents, mineral oil, petrolatum, palm oil, synthetic colours, synthetic fragrances and GMOs. 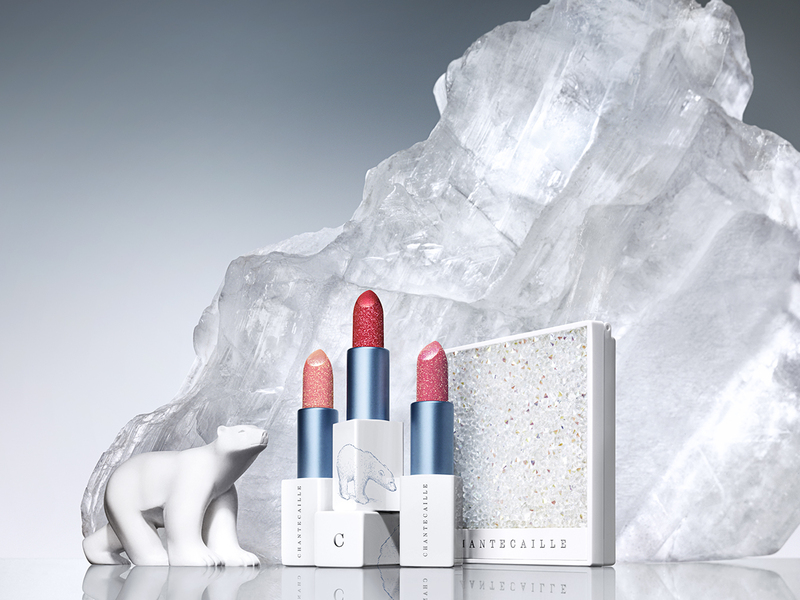 Following its climate change initiative, its Spring 2019 makeup features products emblazoned with a polar bear. To help contribute to the cause, buy a Lip Cristal; one tree will be planted for every sold. The glitter-coated bullets are perfect for the party season, and leaves lips silky, glossed and shiny sans the irritation. To flaunt your belief for the cause, shop the Polar Ice Eye palette that features eyeshadow shades in three distinct finishes, holographic metallic and radiance with nine wearable hues. Chantecaille and de Gournay make a perfect pairing — both are proudly European, family-owned brands. The latter’s roots date back to 1896, and are celebrated for their artisanal fabrics and hand-painted wallpapers. Sylvie and Olivia were drawn to de Gournay’s ethos of bespoke products and worked closely with the house’s artists to customise a chinoiserie Chantecaille design that takes inspiration from Rose de Mai, a delicate flower the brand often references. The pastel pink design covered in roses, foliage and exotic birds are available on the limited edition Lumière Rose: A shimmering pale pink highlighter that delivers an instant-filter glow effect as well as the Darby Rose fragrance, a rework of the brand’s iconic scent.